The Bacara Resort and Spa is located about 10 minutes north of Santa Barbara and boasts an incredible location on California’s central coast. 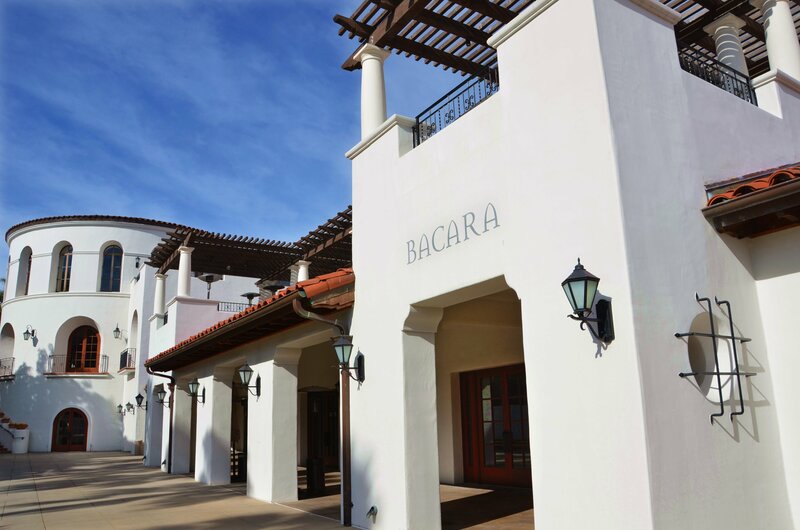 The Bacara Resort is designed with a Mediterranean warmth that meets old Hollywood glamour and, from its inception in 2000, it has been a retreat to a luxury and celebrity clientele. The resort was undergoing some major renovations during my original visit at the beginning of 2011, and many of the buildings were under tarps which diminished the appeal of the resort at that time. This was not a fact I was made aware of prior to my visit so I was caught a little off-guard. Keeping a resort current and newly renovated is always a good thing, but when booking a room, it’s also always a good idea to ask if there are renovations happening at the time you want to book your stay. This gives you the option to book at another time or to request a room as far away from the renovations as possible because nothing can ruin a luxury vacation like hammers and drills going off at 8:00 am in the morning. I’m happy to report that as of my most recent stay in early 2014, all renovations have been completed and the resort is, once again, in its full glory. I was happy to see that they stayed with the same warm and welcoming Mediterranean decor and had not lost the charm and character by “contemporizing” the rooms into a cookie-cutter design style. 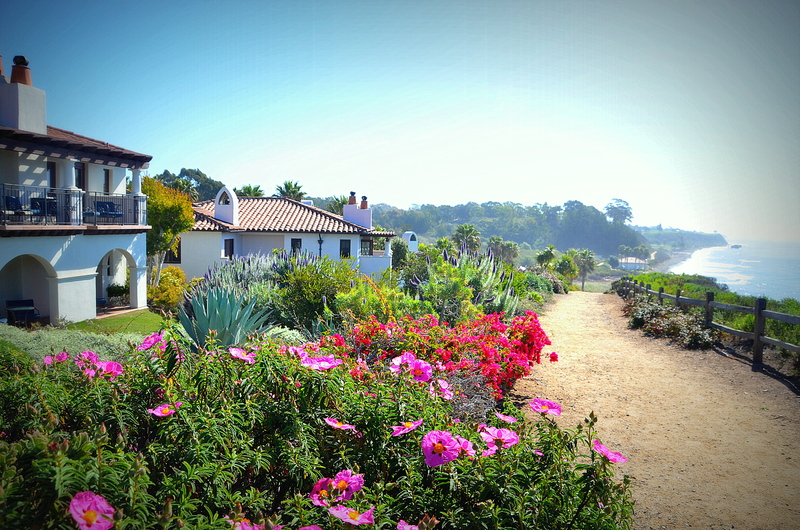 Santa Barbara has a rich Spanish history and this resort honors that heritage. As someone who appreciates architectural details, I revel in the subtle design elements and lush foliage throughout the resort. The crisp white paint, clay tiled roofs and wrought iron details create a beautiful contemporary Spanish feel throughout the resort. Splashes of color are thrown in with decorative tiles and in vegetation plantings around the property. The property is richly planted with greenery, bougainvillea, and bright annuals in beautiful pottery. The grounds are meticulously maintained and Palm trees scattered throughout give it that quintessential California touch. There is direct access to the beach but a fact to know is that Santa Barbara has oil rigs offshore and some tar does tend to wash up on this shoreline. There are nature walk paths and a path along the cliffs which is a perfect location for witnessing a stunning sunset. When booking a room at this property, a very important fact to know is that, although this is the only resort that actually resides right on the waterfront in the Santa Barbara area, the ocean view rooms are very limited due to how the resort sits on the property. Of 359 rooms, only 20 or so rooms have direct ocean views. The majority of the two and three-story buildings are designed in a village setting with a majority of the rooms set around a courtyard. Even rooms categorized as partial ocean view may mean stepping out on your balcony and peering around a corner or over a few rooftops in order to capture a view. That’s not to say that the standard rooms don’t have nice views, as the grounds are lush and beautiful and offer very serene settings. I only point this out for those who are truly intent on having an ocean view. So here are some No Ordinary Resort insider tips for choosing some of the best rooms on property. Ocean Views: Typical with most resorts, the best ocean view rooms are going to be the Penthouse and various suites and villas located directly at the water’s edge. Building 2 is the prime location for these rooms. Building 10 is where the resort residence is located and boasts beautiful coastline views. Other great views can be had from the upper units in buildings 4, 6, 8 and 9. A little hidden secret…if your budget can’t afford the cost of a suite, room 8305 is a regular ocean view king room with one of the best ocean views. If you don’t mind being above the Bistro, Building 18 has suites with great water views as well. Partial Ocean Views: Many rooms are categorized as partial ocean views and the views vary quite a bit. Some of the rooms located on the first or second floor of the ocean front buildings listed above are considered partial ocean views because they are slightly blocked by the landscape plantings and are good options for this category. I was lucky enough to stay in a category called a Terrace View Suite, which does not sound like it would have a view but I overlooked the pool onto the ocean and I thought it was a beautiful view. This was room 19312, a good room to keep in mind. As much as offering you the best rooms available is important, I also feel that informing you of rooms to stay away from is also as important. In this case, there probably aren’t many I would say that are bad as the resort is beautiful but I did notice that there were some rooms in building 13 that were very closely located to and faced directly into building 19. I would caution you to stay away from these rooms. The description of the rooms locations are lengthy but because of how this property is designed, I thought it important to really give you a feeling for what the rooms here offer. The rooms themselves feel spacious and offer a Mediterranean design in keeping with the rest of the resort. Rooms have a coffee maker, basic mini-bar offerings for purchase, and free wifi. The full service spa is a huge draw for guests and locals alike. The Bacara Spa offers over 60 specialized treatments such as Wisdom of the Sea, OSEA Sea of Life and Sea Stone Therapy utilizing local organic herbs and salts and can be enjoyed on a rooftop terrace with a glass of bubbly. Along with a hair and nail salon, this is truly a luxury spa and place to be pampered. The spa also has a large boutique selling very nice resort wear, cosmetics and accessories. Many complimentary fitness classes are offered to guests through the Fitness Center along with an adult-only pool option. The resort also offers 3 tennis courts and a tennis shop. Golfing can be arranged at a near-by range. Special organized activities include a Michael Jordan Camp and Kobe Bryant Academy. 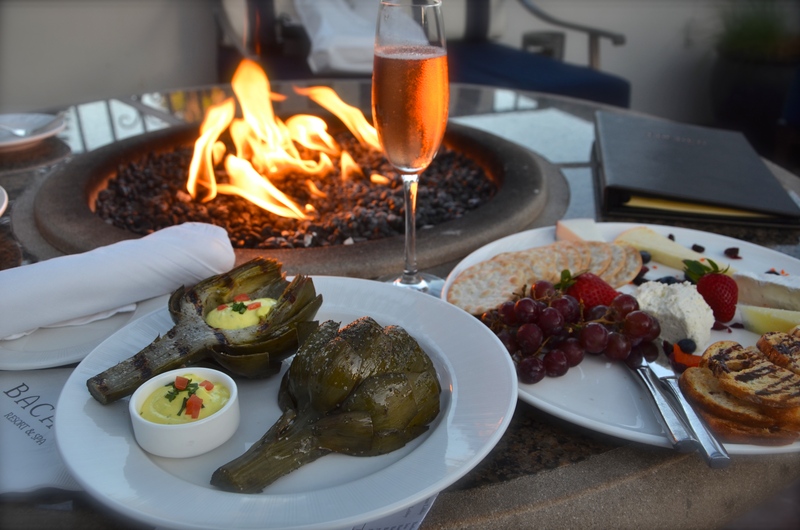 You’ll find several different dining options from fine dining at the Miro Restaurant, to a relaxed fare at The Bistro all the way to casual fare at the Bacara Bar featuring both indoor or, my preference, outdoor fireside nibbles. Other options include the Spa Cafe, Blend Coffee Cafe along with 24 hour in-room dining. Yummy nibbles at the Bacara Bar. 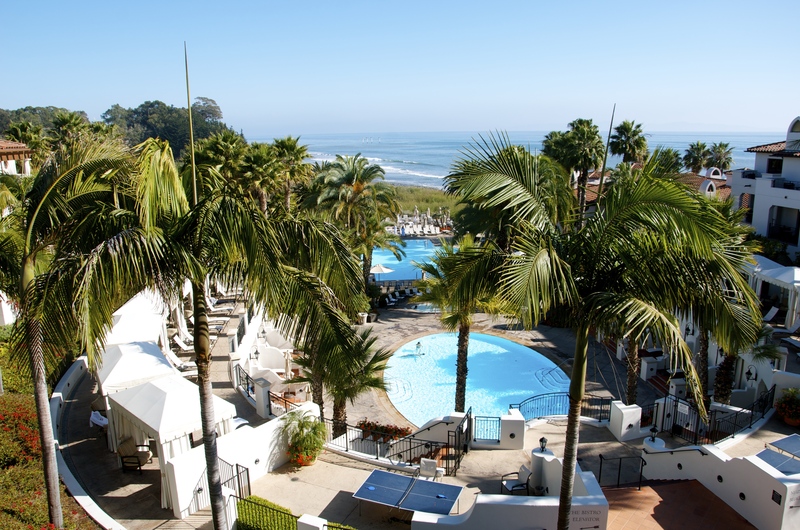 This resort offers many great options for personal, wedding or corporate events and houses the largest ballroom between Santa Barbara and Los Angeles. The beautifully appointed ballrooms, the light and bright Rotunda room with ocean views and a 206 seat theater will make an impressive impression for any event. Feel free to bring Fido, as this is a pet-friendly resort with a one-time pet fee. A recent perk to the property is a house Mercedes Benz van that offers transportation into downtown Santa Barbara. Enjoy the beautifully designed, on-sight Foley Wine Tasting Room located at the front entrance of the resort. Overall, I’ve stayed at many different resorts in the Santa Barbara area and this property is one of my favorites. The casual elegance of the property, along with all of the amenities offered and accommodating service from the staff make this a great choice for a central coast getaway. « Gettin’ My Cowgirl On!